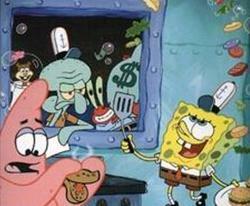 We found many ideas on other websites to organize a fun Spongebob Squarepants birhday party. You will find how to make invitations. 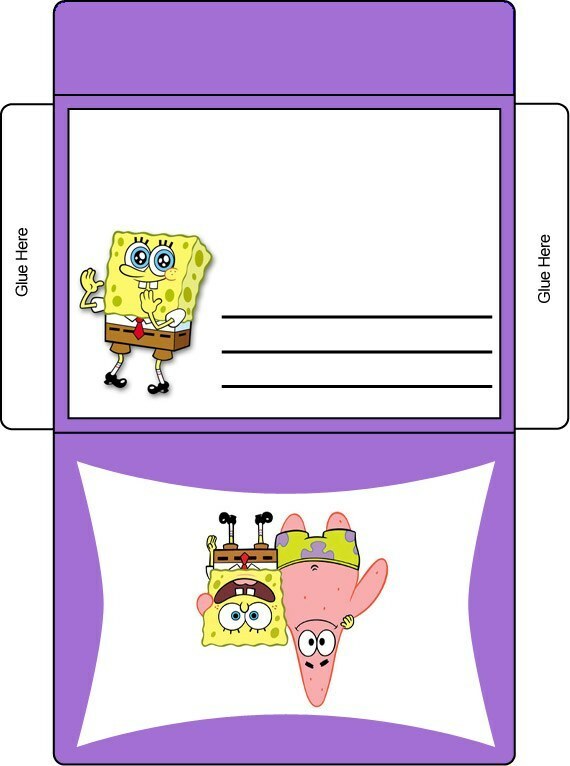 Printable spongebob cards, envelopes, bags and more. Also delicious spongebob foods and drinks. And a lot of spongebob party game ideas to have a great time on your party! Send invitations 2-3 weeks in advance. For your Spongebob party invitations, cut yellow sponges in half and glue them to the front of white invitation cardstock. 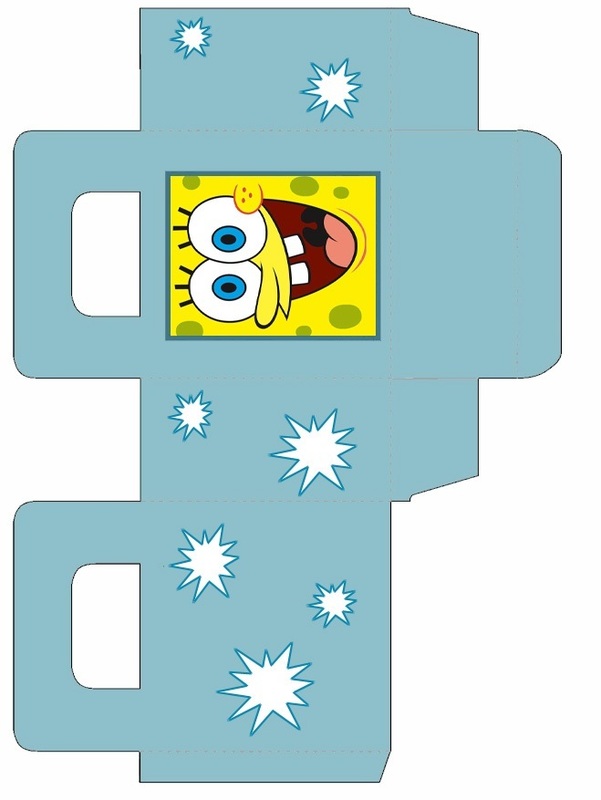 Then scan Sponge Bob's picture, print it on cardstock, and glue it with hot glue to the center of the sponge. "Who lives in a pineapple under the sea..." And on the inside write "You're invited to (your child's name) ....th Spongebob birthday party, which will be held at Bikini Bottom (address). Cast off (date) Dive/Resurface (time)" Then include all the remaining party details. "I'm ready, I'm ready, I ready to celebrate my birthday!" Include your details on the back. Build the excitement by delivering your invitations with a small bottle of bubbles or a pop-up sponge! 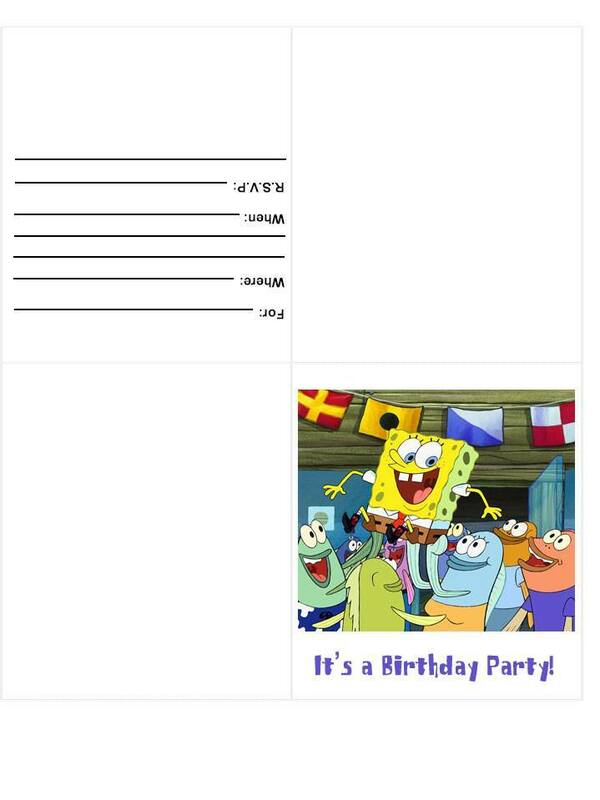 As a variation, you can make your Spongebob birthday party invitations using regular blank white cards. 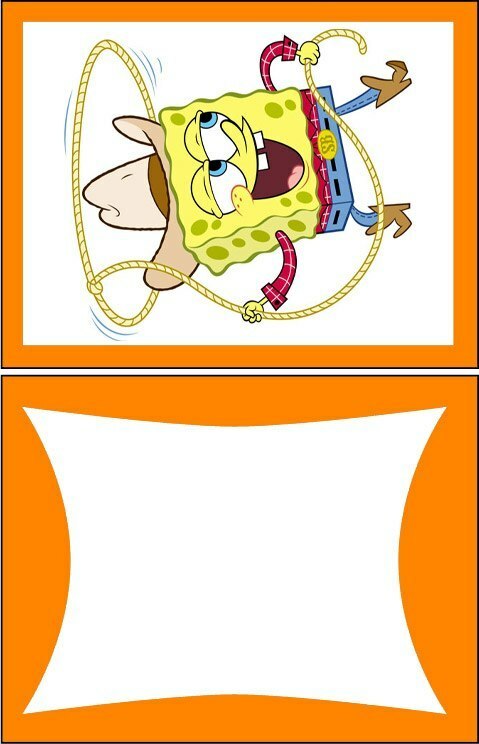 Simply print an image of Spongebob on the front of the invitation cards. Then write your party information on the inside and decorate the invitation cards with stickers. List several of the activities you'll be doing with some menu items on the back side of the invitations. Be as creative as you can with Spongebob party decorations, just remember to stick with the theme. Play Sponge Bob music CD in the background. 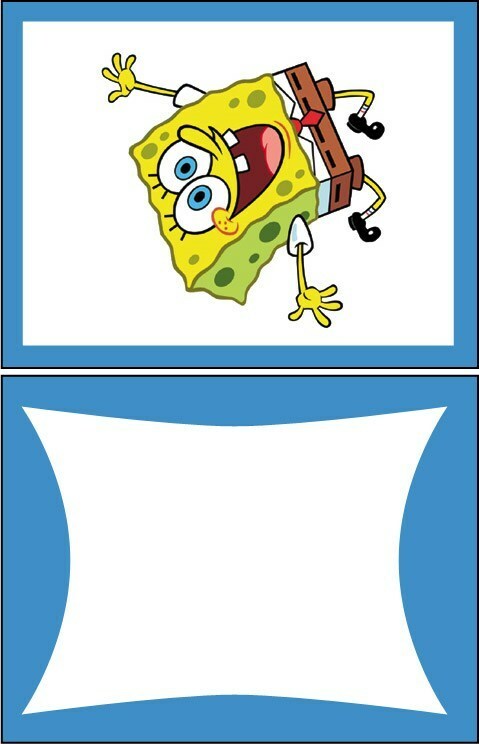 Cut Spongebob theme shapes out of construction paper (e.g., sponges, pineapples, jellyfish, seaweed, etc. ), and tape them to the fence. As a variation, you can drape a large decorative fish net over the fence, and add some fake seashells, life preservers, crabs, lobsters, sea horses, etc. Hang blue balloons in bunches near the driveway entrance to mark your Spongebob birthday party spot. Get your child to write "Bikini Bottom This Way" (and draw an arrow pointing to the front door) on the driveway with colorful chalk. Set up some inflatable palm trees in the backyard. Spread out lots of yellow streamers around trees. Hang yellow sponges on strings from the tree branches. You can also bring in piles of sand to your backyard to create beach atmosphere (decorating with sand pails and other beach items). Post a sign near the front door that says "Welcome to (your child's name) Spongebob Birthday Party!" Get several fish tanks (pet stores sell tanks with small castles inside), fill them up with water - you can have real fish or Spongebob toys inside them. Scatter theme items around the party area. Hang blue and green streamers on the windows. Mount Spongebob poster on the wall. Cut out circles from blue or white construction paper for "bubbles," and put them on the wall above the poster (to look like bubbles are coming out of Bob's mouth). Designate an area for "Jellyfish Fields": put up a sign, and fill it with pink balloons with streamers dangling from them. Make a mural of an underwater scene using turquoise blue tablecloth for the water, green streamers for seaweed, paper fish and a fishnet with shells and crabs. Put a large image of Spongebob in the middle. You can rent a bubble-making machine and set it near the scene for "bubbly fun!" Cover your Spongebob birthday party table with a theme tablecloth, and place a pineapple for a centerpiece. Tie colorful balloons to the backs of the chairs. Hang a personalized "Happy Birthday" banner nearby. When your Spongebob birthday party guests arrive, welcome them to Bikini Bottom and place a lei around their necks. Invite the kids to color Spongebob coloring pages while they are waiting for others to arrive. 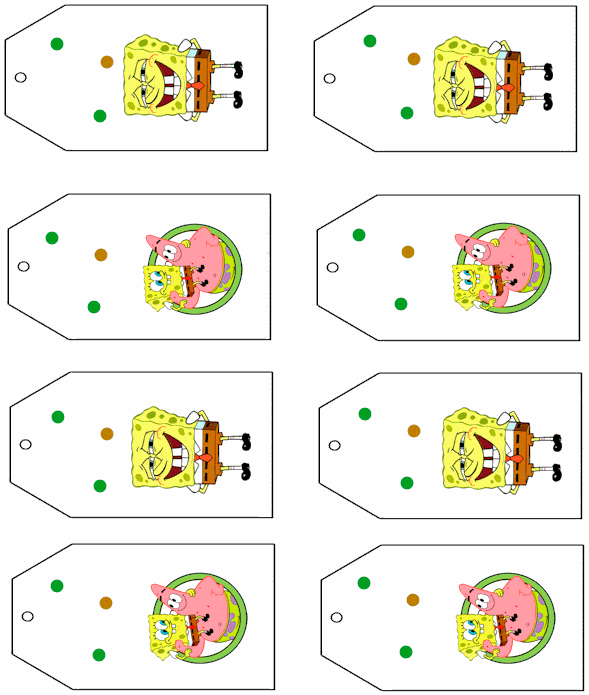 you can download spongebob coloring pages here. You can get "candy creation" kit from a party store. At activity time, have the kids create colorful candy concoctions that they can eat after dinner. Before the party, mount Spongebob poster on the wall. 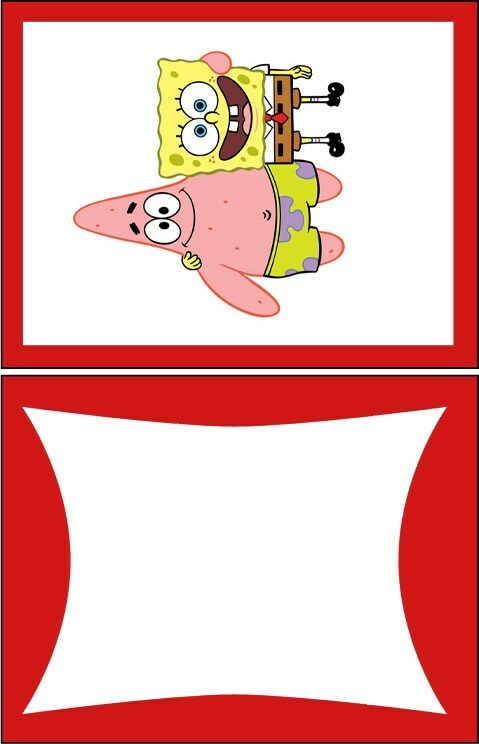 Cut rectangular squarepants out of brown poster board (enough shapes for all the guests). Place a piece of double-sided tape on them. You can print spongebob and the pants here. One by one, instruct every child to close his or her eyes, then spin them around, and point them toward Spongebob. Have them stick the squarepants on Bob where they belong. Give each guest a container of bubble solution and a bubble wand. Let them try to blow the largest bubble, the most bubbles, and the smallest bubble. Use rectangle kitchen sponges and paint to sponge paint. brown construction paper, google eyes, glue etc. Placed on blue paper. using the name of Spongebob's cranky neighbor. You can do the same with Red Rover or tag as well. wants you to send (name) cross the ocean. and large sponges for the kids to toss and catch! Come up with 5 or 6 clues, and write them on index cards. Here are some examples of clues: "Look under the table, for a small bit of a fable." Write the words backwards so the party guests must hold the index cards in front of a mirror to read. Other clues may include: "I'm cold on the inside, and run all day and all night"(refrigerator). The place where boys and girls love to play with bubbles" (bathroom). Try writing the previous clue with white crayon on white index card. Leave it with a colored marker and a note instructing the Spongebob birthday party guests to scribble all over the paper to reveal the message. "With so many subterranean friends to help you out, you're sure to solve this mystery, no doubt! Go back to the place where you began and discover the cake, I know you can!" Hide the clues throughout the party area, and include seashells with each clue, as a prize. At game time, have the children work as a team to solve the mystery. Buy some butterfly nets from the one dollar store. Buy small pink balloons, let the adults throw the baloons in the air, so the kids can catch the jelly fish with their nets. Play this Spongebob birthday party version of classic "Duck, Duck, Goose" game. Hand out a paper plate and pencil (or marker) to each child. Have children, one at a time, put the plate on their head and draw Sponge Bob on the white side of the plate. Then they must show their drawing to the rest of the party guests to the amusement of all. After they have all drawn Sponge Bob, try having them draw a different fishy friend. Define the boundaries of a square shaped area. Have the birthday child start as Squidward by standing in the center. Have all the other "fish" line up at one end of the square area. The birthday child starts the game by yelling, "I'm the Octopus, king of the tide. Can you cross to the other side?" All the fish try to run across the ocean as Squidward tries to tag them. If tagged, fish become part of Squidward's tentacles, and they must reach out and tag the other fish running by while keeping one foot planted. The game continues until all the fish become part of Squidward. The last fish caught can be the new Squidward. For this Spongebob birthday party activity, you'll need a wading pool, stepping stool, bubble mix (dishwasher liquid), hula-hoop and camera. At game time, have each child stand on the stool in the middle of the pool. Pull the hula-hoop over them (they will immediately find themselves in a giant bubble). Have a picture taken of each child inside the bubble. 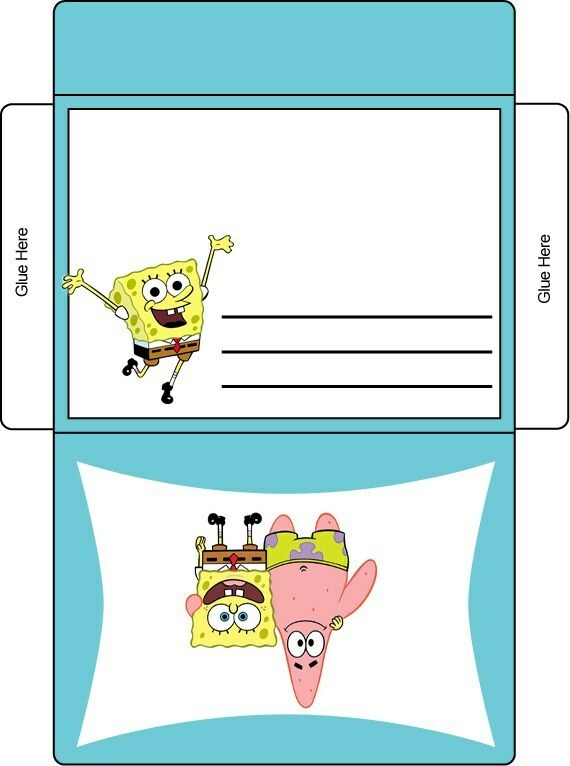 Mail those pictures as memorable keepsakes with 'thank you' notes after the Spongebob birthday party. or poster board, tape and glitter/glue pens (optional). Pre cut or draw the octopus bodies from the paper. Punch or cut a hole in the center. Have the kids decorate their octopuses with markers, glitter etc. Then, inflate the balloons and insert them into the center hole. on the balloon with a permanent marker. Make your jellyfish before the party. Inflate several red and purple balloons then attach a few stands of yarns to hang down. When it's time to play, toss several of the balloons towards the children. Play music while they tap the balloons back and forth to each other. When the music stops...the players who are holding balloons, have been stung. They sit out for one round, but can play again the next round. TIP: Don't put too many balloons into play, or too many kids will be out. For this Spongebob party craft, you'll need newspaper (or plastic Spongebob theme table cover), natural sea sponges, liquid tempera paint (make sure to have green and blue sea colors), small paper plates, white or light blue construction paper, and water cups (one paper cup per guest). Cover the painting area with newspaper or plastic table cover. Pour liquid tempera paint on small paper plates. Distribute sponges and construction paper to the guests. Let the kids dampen their sponges by dipping them in water and then squeezing most of the water out (you may have to assist them with this step). Show all the guests how to lightly dab their sponges in the paint and then press the sponge on their paper. Invite all the Spongebob birthday party guests to assemble in a circle. Have each child extend their right hand into the circle and grab the right hand of another party guest. Then they do the same with their left hand and grab the left hand of any party guest, except the one whose right hand they are already holding. Now see if the knot can be undone while still holding hands! For this Spongebob birthday party game, you'll need 2 pineapples and 2 pairs of oven mitts. Place a pineapple or other marker (a stick or a flag) at either end of the space you'll be using for the race. This race takes up a lot of space, so a yard is best. Divide the guests into 2 teams lined up across from each pineapple. Demonstrate the Krabby walk: put on the oven mitts, then walk on your hands and feet, with your body facing up, and your arms stretched down behind your feet. Let the kids watch SpongeBob Squarepants show to unwind at the end of the party. Purchase your child's favorite flavor of boxed cake mix. Bake 2 round cakes according to package directions. Let the cakes cool. Leave one cake whole and cut the second cake into five equal pieces (like cutting a pie). These pieces will become Patrick's starfish legs. Frost the entire starfish with red or pink icing. Draw Patrick's nose, eyes, etc. Decorate with colored sprinkles while the icing is still moist to give Patrick a spiny texture. Spread blue frosting on the tray to make it look like Patrick is in the water. For this Spongebob birthday party cake recipe, you'll need one prepared 3 oz. vanilla, butterscotch or lemon pudding; 1 cup vanilla wafer cookies; 1 new plastic sand pail (about 9-cup capacity); 1 plastic shovel and shell candies. Bake 8" round cake and cut it into 1" slices. Fit the cake slices into a plastic pail, alternating cake layers with pudding (ending with pudding on top). Sprinkle with crushed vanilla wafer cookies and top with shell (or other) candies. Serve with plastic shovel. Purchase burgers and fries from local supermarket, fast food restaurant or make them yourself at home. Write "Krabby Patty Burger" and "Krusty Krab Fries" on labels. Stick labels on wrapping (if needed, rewrap burgers and fries with white paper or napkins). For this Spongebob birthday party snack, you'll need birthday child's favorite sandwiches, peanut butter, celery, cheese, crackers, ham, cream cheese, fruit, and wooden skewers. Arrange a "feast" by assembling a wide variety of foods on several small platters. Cut the sandwiches in different fun shapes. Spread peanut butter or cream cheese on celery sticks. Roll cream cheese in slices of ham. Arrange cubes of cheese and a variety of crackers. Stick pieces of fruit on skewers. Mix the following items in a big bowl or platter: peanuts, chocolate candies with colored shell, licorice pieces, granola, pretzels, raisins, shredded coconut, dried fruit and other snacks. Prepare the birthday child's favorite cookies. Cut them into star shapes before baking. Decorate with sprinkles and jimmies. For the following Spongebob birthday party drink, you'll need 3 cups of blue drink (flavored powder mix or sports drink), 3 large scoops of vanilla ice cream (or frozen yogurt) and 3 cups of ice. Mix all the ingredients together in a blender. Blend until smooth. Serve in tall glasses with cocktail umbrellas. You'll need 1/2 cup chocolate flavored syrup, 2 cups milk, 2 cans cola or ginger ale (room temperature) and whipped topping. Stir together chocolate syrup and milk until well blended. Microwave uncovered on High for 3-4 minutes, or until hot. Poor heated mixture into 8 paper "hot" cups or mugs. Slowly pour soda into each cup. Top with whipped topping. After pouring your child's favorite drinks into cups, drop a few Pop Rocks® candies into each glass. They will crackle, pop and spit, turning the drinks into Octopus Brew! Simply mix green sherbet, blue coloring and lemon-lime soda together.